TUFFA Products’ extensive catalogue of custom safety solutions was designed specifically to meet offshore industry demands. 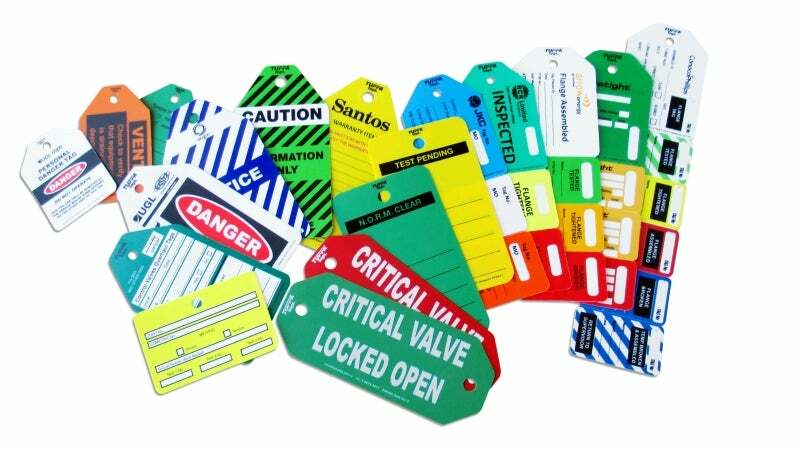 The company’s product range includes its flagship collection of TUFFA Tags, as well as prestart and safety books, safety signs and notices, wire locks, industrial labels and printed pipe markers. Our TUFFA Tags have proven to be robust and hard-wearing in even the most adverse marine environments, allowing them to overcome fading and tearing issues faced by competing products on the market. Manufactured to withstand the harshest industrial conditions, TUFFA Tags are made from incredibly tough Raptor Poly material, and are resistant against UV exposure, water damage and oil and chemicals contamination. Their heavy-duty construction gives clients the peace of mind to know that applying a TUFFA Tag to important equipment and machinery means it will stay tagged, regardless of how extreme the working environment is. Joint integrity management is a critical process across all oil and gas projects, and TUFFA Flange tags are the ideal tool for supervisors and engineers alike to create a system of traceability and accountability for their flange management procedures. Our tags allow customers to take their flange management procedures to the next level by the addition of sequential numbering features, facilitating comprehensive and organised tagging. TUFFA is an expert in flange management tagging, and supplies fully customisable, organisation-branded tags to a long list of loyal clients on an international scale. The company is able to create bespoke tags tailored to customers’ specific requirements, which are able to further boost corporate images by featuring company logos. TUFFA wire locks are an excellent, all purpose, multi-use lock-out device that is becoming increasingly popular within the offshore sector. Products are equipped with a unique, one-use ID number making them tamperproof, and once the cable is inserted it can only be removed by cutting. The wire also splays to prevent reinsertion, which makes the device a versatile and secure safety option. TUFFA’s lock-out range also includes a number of hasps and padlocks, in addition to circuit breakers, valve and group lock-outs and lock-outs stations. TUFFA is pleased to offer an array of printed safety materials, and its range of off-the-shelf items can be customised according to clients’ particular needs and requirements. Our Take 5 safety books have been carefully written and created to help workplaces reduce and avoid many of the accidents that occur during marine applications. The Take 5 system is simple and easy to follow, and is designed to be referred to regularly by all staff onsite before undertaking a potentially dangerous task or activity. TUFFA’s Take 5 range of guides and handbooks includes Hazard prompts, Controls, Risk Matrix, Probability, Tolerability Levels and JSA. Our company is also committed to ensuring hazard protection for clients by supplying a number of safety signs, which are compliant for use in the workplace and manufactured in Australia from high-quality materials. Signs identity potential hazards in your warehouse or worksite, and can be used to both inform and update your workforce of nearby risks. If your organisation has unique needs for a safety sign, we are also able to deliver customised designs upon request. TUFFA offer online orders, with quick turnaround and free shipping on select items. Worker safety is something that should never be done by halves. The BassGas project includes the development of the Yolla field located in production license T/RL1 of the Bass Strait, offshore of Australia. TUFFA™ Products Gas Cylinder Status tags are the ideal solution for gas cylinder management on offshore platforms.